Thanks so much to Allen & Unwin for this opportunity! As a part of the blog tour for Girl in Between by Anna Daniels, I’m super excited to share this guest post written by the lovely Anna herself, check out my review here! As a part of the blog tour for Watch Over Me by Claire Corbett, I am excited to share this guest post written by the Claire herself! Check out my review here. A special thank you to Allen & Unwin for providing me with this opportunity. As a part of the blog tour for The Last McAdam by Holly Ford, I am excited to share this guest post written by the wonderful Holly herself! When I’m talking about The Last McAdam I tend to talk a lot about the main characters, Tess and Nate. But Nate isn’t the only man Tess has to face when she arrives to take over Broken Creek Station – Harry, Stan and Mitch live there too. Harry and Stan are at opposite ends of their working lives, but they’ve both spent their entire careers at Broken Creek. Mitch grew up there with Nate, he’s Nate’s best mate, and after a spell away he’s come home to try and outrun his own set of demons. A farm is one of the few businesses where people don’t just work together, they live together too. The kids go to school together. Households blend, as Mitch’s and Nate’s did. Respect is earned (or not! ), the usual power pyramids don’t always apply, and the pecking order might not be as you’d expect. Tess is sent to Broken Creek to streamline a business, but she finds herself having to try to break the bonds of a family. It’s a pretty daunting situation for a newcomer to walk into – even if she hadn’t just accidentally hooked up with the accepted head of the household! Passed down through the same family for over a century, the remote sheep and cattle station of Broken Creek has recently been taken over by global agribusiness company Carnarvon Holdings. Now Carnarvon has sent its best troubleshooting manager, Tess Drummond, to turn the property’s failing fortunes around – fast. When Tess arrives to take the reins of Broken Creek she’s faced with a couple of nasty surprises. For starters, her head stockman, Nate McAdam, happens to be the same gorgeous stranger she hooked up with – and ran out on – a few weeks before. As if that wasn’t bad enough, Nate was supposed to inherit Broken Creek until his stepfather ran it into the ground. Now the last McAdam on the station leads a team of men whose bonds have been forged through hell and high water and whose mission is to see off Carnarvon and Tess so he can take his rightful place. A genius with farm work – and women – but a disaster in the office, Nate is everything Tess believes a farmer shouldn’t be. Determined not to give in to her growing attraction to him, Tess sets out to do her job, but she soon finds herself caught up in the battle of her career. This irresistibly entertaining novel combines romance, suspense and an unforgettable cast of characters. 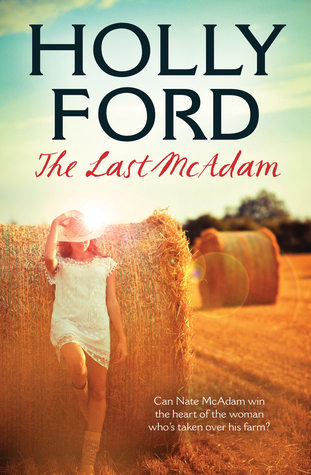 The Last McAdam by Holly Ford is published by Allen & Unwin, RRP $29.99, available now. Holly Ford is the pseudonym of a writer who grew up in a farming community in the Hokonui Hills in the South Island of New Zealand. Having lived and worked on three continents, she returned to her own patch of land in rural New Zealand, which she now shares with her family, an ever-increasing population of magpies and hares, and the occasional vacationing dairy cow. Her bestselling novels, packed with gutsy women who aren’t afraid to take what they want and men who are worth their trouble, celebrate life and love in some of the world’s most rugged country: the vast, spectacular mountain farms that form the backbone of New Zealand. Check out the other stops here! As a part of the blog tour for Third Time Lucky by Karly Lane, I am honoured to publish this guest post written by the lovely Karly Lane herself!